Outside: A parking lot for the car is located at the house and a large lawn with garden furniture invites you to relax in the garden (barbecue included). 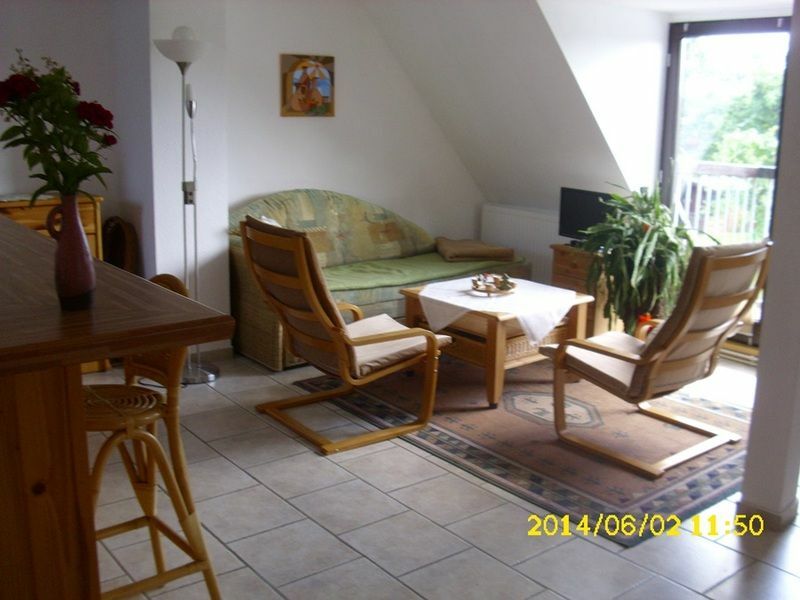 Private Apartment in Rechlin, quiet area at the Kleine Müritz. The Apartment "tree" is located in the upper and attic of a detached house and offers enough space for 4 people. The central location in Rechlin, you can customize your vacation according to your wishes. Anglers, cyclists, families with children, boaters, arriving by boat at the port investors Rechlin, nature lovers or those seeking peace are welcome to join us! Wir wurden sehr nett empfangen und die Ferienwohnung war sehr sauber und hatte alles was man zum Wohlfühlen brauchte! Gerne buchen wir wieder dort! Gute Lage im Ort, sehr ruhig, gut ausgestattete, wohnliche Ferienwohnung. Kommen gern wieder hierher! Rechlin is an attractive place in the southern Müritz region and offers vacationers many interesting recreational opportunities and optimal conditions for recreation. Here is the sailboat with boat rentals, rowing and paddle boats, a bathing area with sunbathing area, various Fahrradverleihanbieter and a fishing license issue in the tourist information Rechlin. In Rechlin Nord is also a large swimming area with beach volleyball court, sandy beach and lawn and the marina on Claassee with 400 yacht berths. The steamship landing in the harbor village regularly offers connections to Röbel, Klink and Waren (Müritz) from April to October. North of Rechlin is the national park village Boek, directly at the southern gate to the Müritz National Park. From here you can take exciting trips to nature on about 650 km of networked cycling and hiking trails. The National Park ticket of the Müritz line (bus service only in the summer season) offers you the possibility to travel by bus with bicycle trailer in the national park. Other excursion destinations include the Aviation Technical Museum in Rechlin-Nord, the sports airfield in Lärz, the Müritz-Therme in Röbel - just to name a few.